HOLDS APPROXIMATELY 90 DOGS, AND 36 BUNS,1 QT OF WATER. MAKE SURE IT DOES NOT RUN OUT OF WATER ! 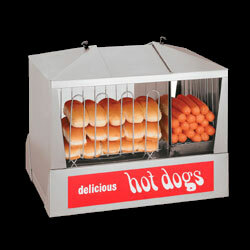 * Please call us with any questions about our hotdog/bun steamer star serving Cary NC and Raleigh NC, Chapel Hill, Pittsboro, RTC & Raleigh-Durham in North Carolina.